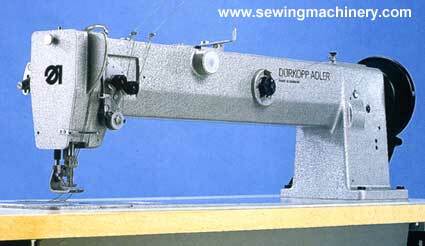 The Durkopp 221 / Adler 221 series is specially designed for difficult sewing operations. This long arm lockstitch machine, with its large clearance, powerful triple feed, high walking action, high material throughput under the alternating sewing feet and great penetrating power, offers the ideal solution for these applications. The robust construction and excellent sewing action give a clean stitch pattern and uniformly tight stitch formation, when processing thick threads and heavyweight materials. The expanded bobbin capacity of the extra large vertical hook guarantees long sewing cycles without bobbin changes, even when working with thick threads and heavyweight materials.